Mount Gutmann, 48 kilometers from Benxi City, is characterized by steep cliffs and waterfalls The Junmei and Tanghe rivers form valleys through it Clouds and fog curling up from the valleys make the peaks appear mysterious. 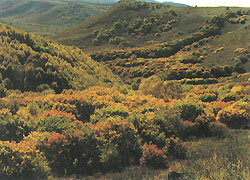 The mountain is covere in dense vegetain and has a wide variety of tree pecies. In June every year magnolias bloon all over it, mmitllng a fascinating scent. 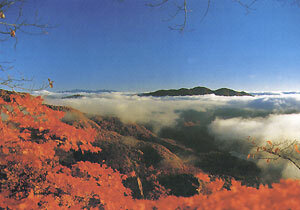 Red leaves In late daumn and evergreen pine trees in winter add splendor to Mount Guanmen. The Tanggou Ravine Hot Spring, 78 kilometers from Benxi City, is surrounded by mountains covered in green trees. The hot spring is located in an area of same 20 Mu, whjith the temperature of the water reaching 76 regimes Celsius. The hot spring water contains minerals such us sodmltt carbonate, manganese carbonate and trace elements favorable to human health Hence the name tile thicasule spring Sprier, summer and airline are the favorite tourist seasons in the in the Benxi National Forest Park.